USA Today Travel released a video instructing passengers to post photographs to social media if they felt their space was invaded. One fat passenger responds. You recently released a video about airline passengers’ recourse when they feel another passenger is encroaching on their space. Your video was released on Oct. 15, 2018. I saw it yesterday, on Nov. 20, 2018. It played automatically as I read a story about airline travel. If you can, discreetly take pictures. Include them with your complaint. If the airline doesn’t respond appropriately, post your pictures on social media. I felt dizzy, nauseated. Your words took the wind out of me, like a sucker punch to my stomach. Sudden vertigo bent light and space around me, and I found myself sickened by the new dimension unfolding in front of me. I am a fat passenger, and I will board a plane next week. I am the person your video is about. You instructed thinner passengers to “discreetly” take photographs of me without my knowledge or consent, post them online, and use them to complain to airlines. In my 35 years as a fat person, I have become accustomed to the casual and constant cruelty of thinner people on airplanes. But I have never seen it encouraged so publicly — much less by a mainstream newspaper. Today, I am incandescent with anger and hurt. But more than that, I am terrified of what will happen when I fly next. And I have so many questions for you. I have spent the last long day and the restless night before it trying to step into your logic. I imagine the office where you sit, the conference room where you decide what to publish and when. I imagine the team that writes for you and the team that edits. I imagine kind and thoughtful people who enjoy each other’s company. I do not imagine any fat people. I imagine that you thought this would be an easy video to produce — something quick to address a common problem, a companion piece to run with your many articles about air travel and how to maintain passengers’ comfort as seats endlessly shrink. But after that, my imagination runs out, like a needle wandering aimlessly at the end of an inky vinyl record. I try to imagine that you thought of fat people among the passengers your video would serve, but I cannot. I try to imagine that you considered me or the 67 percent of Americans with bodies like mine when you made this video, but I cannot. I struggle to find something benign in your video, something borne of misplaced good intentions. Still, I cannot. I am left only with questions. I know you have written about the data: Airlines are endlessly shrinking airplane seats (and now bathrooms) to maximize their profit margins. Consumers are responding. Congress is now stepping in to regulate seat size since the Federal Aviation Administration declined to regulate itself. Do you also produce videos about how those shrinking seats impact people with disabilities, people with limited mobility, and, yes, fat people? Did you research what happens when complaints like the ones you recommend are made? 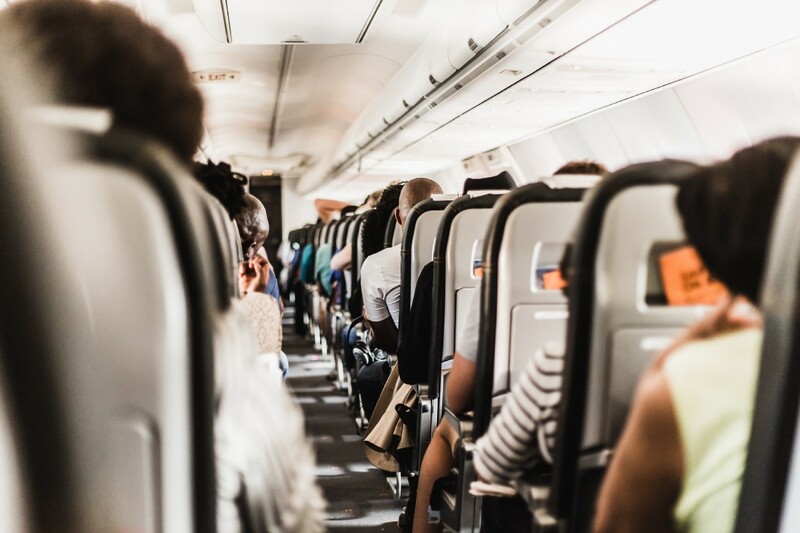 Did you find the story of Errol Narvaez, who painstakingly researched how to safely fly as a fat person but was still escorted from the plane in front of rows of watchful, silent faces? Did you read about Natalie Hage, the student whose rowmate “discreetly” texted friends to gleefully joke about her body? Did you learn about Vilma Soltesz, who was refused air transport to receive medical care, then died half a world away from her home and the doctors that may have saved her? Do you produce videos for fat passengers who face uncertainty and the possibility of humiliation anytime we board a plane? You have advised thin people on how to retaliate for the injustice of sitting next to us. What should we do when we are never certain we will be allowed to keep our seat or our privacy? What should we do if we see our own bodies “discreetly photographed” on social media? Do you know fat people well enough to love us? Not people who feel fat but people who are undeniably fat. People who get nervous stepping onto planes or into restaurant booths, uncertain if their bodies will fit. Have you asked them what it’s like to move through a world that was never built for them? Have you asked them what it feels like to be rejected everywhere, like a body rejecting a transplanted organ? Have they told you what it is like as a fat person to step onto an airplane? Have they told you about the research into inconsistent and unreliable passenger of size policies? Did they tell you what it takes to find twice the money to buy a second seat? Are they tense from carrying the burden of growing credit card debt, charging an extra seat just to make it to a work conference or a family funeral? Did they tell you how, even when they bought another seat, the airline still sometimes offered it to another passenger? Or when you asked, did they stay quiet, certain of what would follow if they actually spoke to their experience? Did they hold their breath instead of telling you what it feels like to be pushed on from all sides, told that your body is your fault, forever your fault, and forever a burden to those around you? Did they fear the hot and bottomless well of rage that lives within so many thin people, so readily spewed like magma when fat people share our experiences? Has anyone told you what it’s like to turn your face away from news stories about weight for fear that their body has been “discreetly photographed” for B-roll? Or have they told you what it’s like to see their own photograph used as a meme, a cruel joke that, like a starfish, endlessly regrows itself? Do you know what it is like to live in a body like mine? Do you know what it is like to constantly fear that others will respond with contempt or violence just because of the shape of your skin? Do you know what it’s like to have that fear so frequently realized? But most of all, I wonder this: As this video has caught increasing attention on social media, will you “respond appropriately” as you tell passengers that airlines should? Will you take it down? And will you apologize? Like this story? There are more like it. You can also find Your Fat Friend on Twitter, Facebook and Instagram.